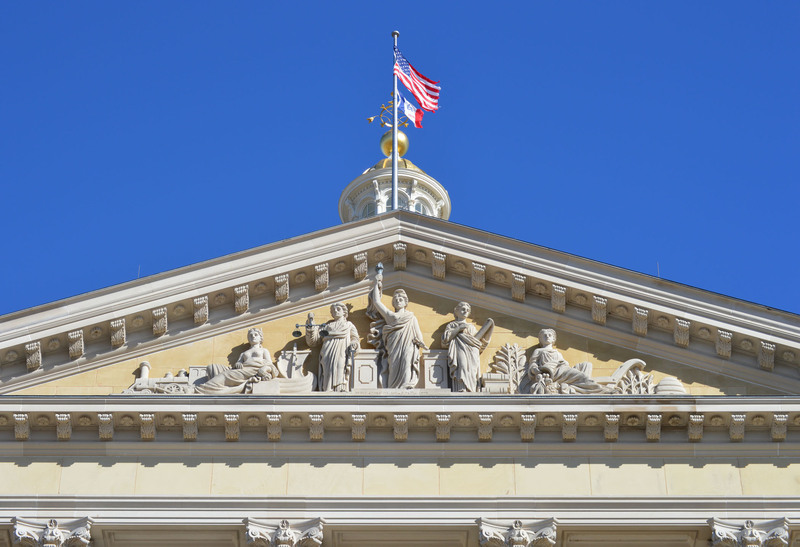 After withdrawing its waiver, Iowa can now turn to more practical and less disruptive proposals to improve affordability and increase competition in its insurance market. Guest post by Sarah Lueck, senior policy analyst at the Center on Budget and Policy Priorities. She wrote this piece originally for CBPP’s “Off the Charts” blog. Find the original post here. Iowa’s waiver would have made it harder to sign up for coverage. The waiver would probably have raised the number of uninsured individuals by making enrolling far more cumbersome. Iowans now use HealthCare.gov to receive a federal determination of eligibility, pick a plan, and then go directly to the insurer’s website to pay the first month’s premium — often in one sitting. Under the waiver, enrollees would have had to visit a new website to complete an eligibility application, wait up to ten days for the state to respond by mail, and then find an insurer or an insurance agent to actually help them enroll in a plan.It was far from clear that the state’s website would be ready in time, or that thousands of Iowans could complete this lengthy, multi-step process in the six-week open enrollment period. On top of that, the waiver would have eliminated automatic re-enrollment for current marketplace consumers. At stake is health care access for millions, including people with pre-existing conditions. Surely these would be at the top of any list of concerns about Cassidy-Graham. Senator Chuck Grassley of Iowa has made the point himself: The Cassidy-Graham bill to repeal the Affordable Care Act (ACA) has many deficiencies. “I could maybe give you 10 reasons why this bill should not be considered,” he told Iowa reporters. So, let’s look at some of the reasons, on the merits, why people might have concerns about Cassidy-Graham. People with pre-existing conditions would lose access to health care. Protection of these people assured now under the ACA would be left to state decisions, with states already cash-strapped. Many who became eligible for coverage through the Medicaid expansion of the ACA would lose it. In Iowa, about 150,000 people gained coverage by this expansion. It would change Medicaid expansion to a block-grant program that provides states no flexibility to deal with recessions or prescription drug price increases. Medicaid for seniors, people with disabilities, and families with children would be capped on a per-person basis. Anything higher would be left to the states to provide. There is neither any assurance states would want to do that, or even be financially able to do so. Iowa would be marched to a $1.8 billion cliff in 2027 under this bill, with federal support dropping sharply. For context, that is the equivalent of about one-fourth of the current state budget. Millions would lose insurance coverage. While we’re still waiting for the estimate from the Congressional Budget Office, past repeal proposals show this. And, since this bill offers nothing beyond 2027 for the Medicaid expansion, via block grant or otherwise, the prospect of 32 million people losing coverage (as demonstrated in estimates in previous ACA repeal legislation) is very real. In Iowa? The graph below shows how Iowa’s uninsured population has dropped with the advent of the ACA, or Obamacare. Census data show uninsurance in Iowa dropped by nearly half in just three years, by about 116,000 — from 8.1 percent uninsured in 2013 to 4.3 percent in 2016. So, this is a good start on why Iowans might be concerned about Cassidy-Graham — a last-ditch effort to rush into law radical changes in the way millions nationally and over 100,000 in Iowa gained access to health care in just three years. We invite Senator Grassley to add to the list and get us to the full 10 reasons he suggested that might cause concerns about this bill. Or better yet, maybe together in a deliberative process that involves everyone, we can come up with a list of 10 things that any health care policy should address. Surely the list would include insuring more people, assuring more with practical access to health care when they need it, improving public health and reducing costs. We invite Senator Grassley to that discussion. The problems with the insurance exchange in Iowa are fixable — and not a good excuse to fund tax cuts to the wealthy by forcing tens of thousands of Iowans off health insurance. It’s time for Iowa’s congressmen and senators to start working on immediate measures to strengthen the health care system, and specifically the health insurance exchange, or marketplace. The obsession of some with bills to repeal and replace Obamacare has been a distraction from that task. In recent days, bipartisan groups have sprung up in both the House and the Senate to begin developing legislation to stabilize the insurance market. These groups recognize the immediate need for measures to ensure that federal payments continue for cost-sharing reductions (CSRs) that help low-income people afford their copays and deductibles. Without the assurance that these payments will continue, premiums will rise sharply. The president has threatened to continue his efforts to sabotage the Affordable Care Act (ACA) by ordering an end to CSRs. This threat has already prompted Medica, the only Iowa health insurance company still offering plans on the exchange, to plan for another premium increase. The bipartisan efforts to shore up the insurance exchanges could include another important measure: a reinsurance program that would reduce the risk that a small number of high-cost customers will cause insurance company losses. The “million-dollar customer” has been cited as a factor contributing to the decisions of Wellmark and Aetna to exit the Iowa exchange. Reinsurance would establish a national pool to cover high-risk cases; this would allow companies to remain in the exchanges without drastic premium increases on everyone to pay for those few cases. The Senate’s attempts to repeal and replace failed because they were wildly unpopular. These measures would have resulted in over 200,000 Iowans losing health insurance; would have effectively ended the expansion of Medicaid that covers thousands of low-wage workers; would have reduced Medicaid benefits for thousands of seniors, children, and people with disabilities; would have raised premiums and deductibles; would have gutted protections for persons with pre-existing conditions; and would have provided billions in tax cuts to wealthy individuals and corporations. Pragmatic efforts to stabilize the health insurance market stand in stark contrast to a last-ditch attempt to repeal and replace Obamacare that surfaced this week: the Graham-Cassidy plan. 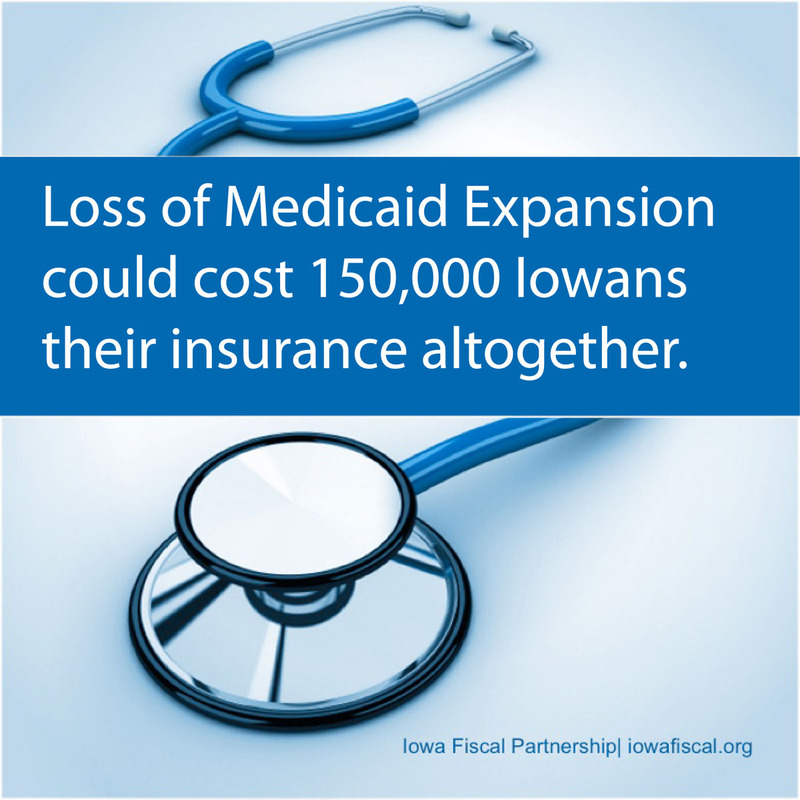 Like the previous failed bills, this plan would end the Medicaid expansion that now covers 150,000 Iowans. Unlike previous repeal and replace bills, the Graham-Cassidy plan would also end the premium assistance that makes health insurance affordable to tens of thousands of low and moderate income Iowa families. While it replaces ACA funding of premium assistance and Medicaid expansion with a block grant, it provides no guarantee that the states will use that block grant to make health insurance affordable to those who need help the most. And the bill would further destabilize the insurance market by ending the mandate to purchase insurance, while making it more expensive, leaving insurance companies with the sickest and costliest customers. The problems with the insurance exchange in Iowa are fixable. Let’s see if our Senators and Representatives actually try to fix those problems instead of using them as an excuse to fund tax cuts to the wealthy by forcing tens of thousands of Iowans off their health insurance. Peter Fisher is research director of the Iowa Policy Project. If the Governor cannot speak for the people of Iowa, who will do so? As it has become clear that Iowa state leaders need to be more engaged publicly on the national health care debate, it was surprising to see Governor Kim Reynolds’ take on it. Well, if that is the standard for where the Governor should speak up, lock the office door and throw away the key. That’s not the way government works — or is supposed to work — in our American and Iowa tradition. The Governor in our system has an important and powerful role, but rarely a controlling one. What the Governor is not acknowledging, though she surely knows to be the case, is that her position is perhaps the best pulpit in the state of Iowa for speaking up on behalf of Iowans, to our elected representatives in the House and Senate in Washington, and to the President of the United States. If she cannot speak for the people of Iowa, who will do so? What is clear from the debate thus far in Washington is that more than 200,000 Iowans will lose health insurance if the current Affordable Care Act is repealed without a meaningful replacement. In fact, the latest estimate from the Urban Institute finds 229,000 fewer Iowans would be insured in 2022 than if the ACA were kept in place — but the state would spend $29 million more as federal spending dropped by 28 percent. The Governor’s comments to reporters repeated inaccurate talking points about ACA, avoiding both the state’s own role in undermining the individual insurance marketplace, and the principal way Iowans would lose insurance: the loss of the Medicaid expansion. That one piece of the ACA covers 150,000 Iowans now and is projected to grow to 177,000 in two years, but goes away under the Senate and House plans. So, whether Governor Reynolds likes it or not, what is now a federal issue will become a state issue. Right now, the things she has more direct influence upon are state budget choices, many of which already are difficult. Imagine how much more difficult those choices become with 200,000 more people uninsured. What will the state do to make up for it? What budget control — or families’ control over their health care options — would be lost? Some members of the Legislature already are calling for a state-run program to step into the void. If Governor Reynolds is uncomfortable with any of these possibilities she could call her friends Senator Grassley and Senator Ernst, or gather the microphones and cameras and raise awareness about the stakes for all Iowans. Again, there are members of the Legislature weighing in on that score as well. Perhaps they recognize that persuasion, and pushing for a critical mass of support behind an idea, is where “control” emerges. 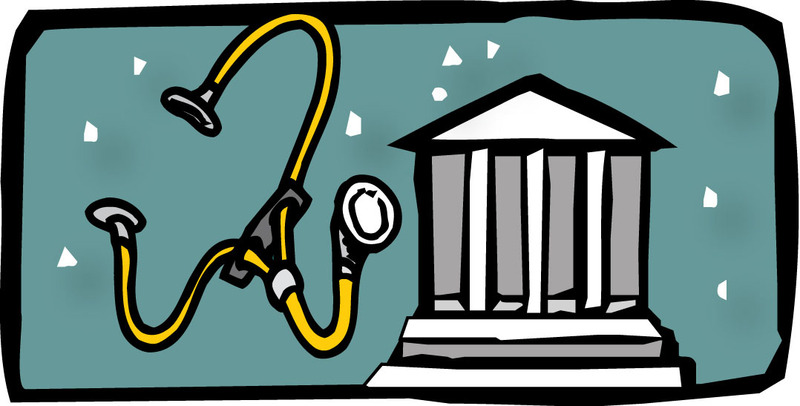 Health exchanges: Why not fix? Iowa’s insurance exchange has only one insurance company offering policies. But instead of fixing that, our representatives are using it as an excuse to repeal Obamacare, including the Medicaid expansion. What would be your response if someone said to you: “The transmission in my car needs an overhaul. This just proves vehicular transportation doesn’t work, so I am going to get rid of my car and my pickup, even though the truck is still running fine.” You would probably think they were crazy. Why not just fix the car’s transmission? Yet this is the logic being put forward by Senator Grassley and many others as they seek to repeal Obamacare. Yes, we have a problem with the insurance exchange in Iowa, where we now have just one insurance company offering policies. But instead of pursuing solutions to that problem, our representatives are using it as an excuse to repeal Obamacare, including the Medicaid expansion, which has nothing at all to do with the insurance exchange and in fact is still in good running order. The lack of insurers in the Iowa exchange is largely a self-inflicted problem. Insurers have left the market in part because the state of Iowa did so little to encourage people to sign up, and to provide assistance in navigating the exchanges. Iowa was also extremely generous in allowing people to continue with existing poor-quality insurance. The problem was worsened by President Trump’s efforts to sabotage the exchanges during the final weeks of the annual sign-up in January by banning all advertising and encouraging people to think Obamacare was going to end. As a result, the number enrolling in the exchanges, which had been on a pace to exceed that of the previous year, ending up falling short. Too few younger and healthier people enrolled, leaving the insurance companies with older and sicker people. There are solutions to this problem. Both the Iowa Insurance Commissioner and Iowa Democrats have proposed measures to solve the exchange problem at the state level. But the House and the Senate bills repealing and replacing Obamacare, instead of shoring up the exchanges, repeal the individual mandate. Analyses of their replacement provisions predict that they would worsen the problem instead of solving it, leaving the exchanges with even fewer healthy individuals. Now about the pickup truck. The Senate’s Better Care Reconciliation Act (BCRA) would likely result in 232,000 Iowans losing health insurance coverage over the next five years. Three-fourths of them would become uninsured because of the loss of Medicaid, the rest because of cuts in premium assistance for policies purchased on the exchange. Iowa expanded Medicaid eligibility (with 90 percent federal funding under Obamacare) to include low-income non-elderly adults, most of whom are working in low-wage jobs with little or nothing in benefits. 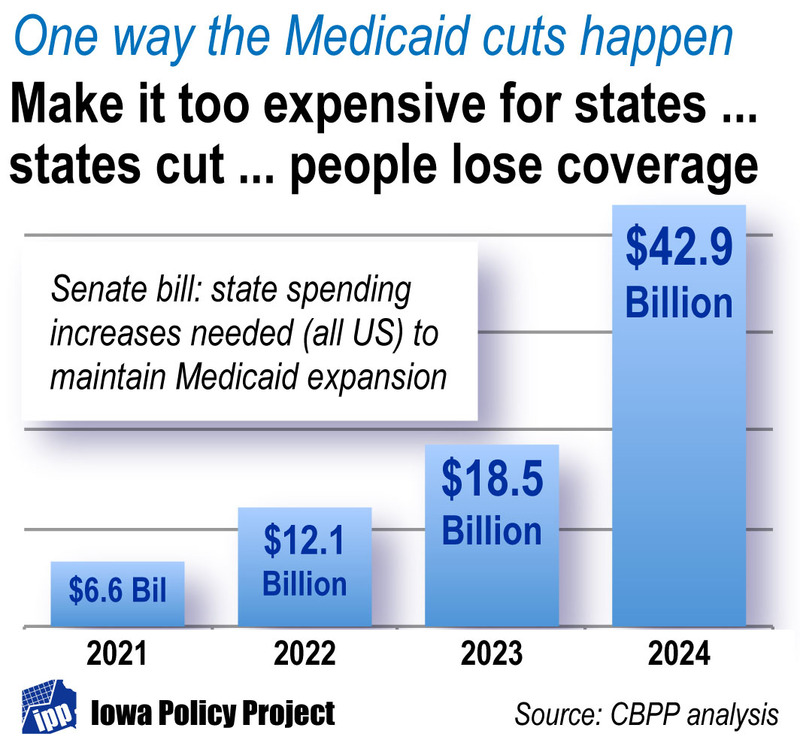 The BCRA would effectively end the Medicaid expansion for about 177,000 Iowans. This will hit rural Iowa the hardest, and it will undermine the finances of rural hospitals. The Medicaid expansion has nothing to do with the health insurance exchanges. Our representatives should stop using a fixable problem with the exchanges as an excuse for passing a broad bill that ends health insurance for tens of thousands of Iowans. Robert Wood Johnson Foundation and the Urban Institute. The Impact of Per Capita Caps on Federal and State Medicaid Spending. March 2017. Author iowapolicypointsPosted on July 12, 2017 Categories Budget and Tax, Economic Opportunity, OrganizationTags Affordable Care Act, American Health Care Act, Better Care Reconciliation Act, Center on Budget and Policy Priorities, Iowa Fiscal Partnership, Iowa insurance exchanges, Iowa Policy Project, Medicaid expansion, Obamacare, Peter Fisher, Robert Wood Johnson Foundation, Senator Chuck Grassley, Senator Joni Ernst, Urban Institute1 Comment on Health exchanges: Why not fix? The stakes for some 200,000 Iowans are significant, jeopardizing recent health-care coverage gains and putting vulnerable Iowans at risk. First, let’s make no mistake: Both the Senate and House bills to repeal and replace the Affordable Care Act (ACA) represent substantial cuts in health coverage, including Medicaid. People will lose coverage, have less coverage, and/or pay more for it. This is a public policy choice being offered in the drive to repeal ACA’s enhancement of insurance coverage for millions of Americans. 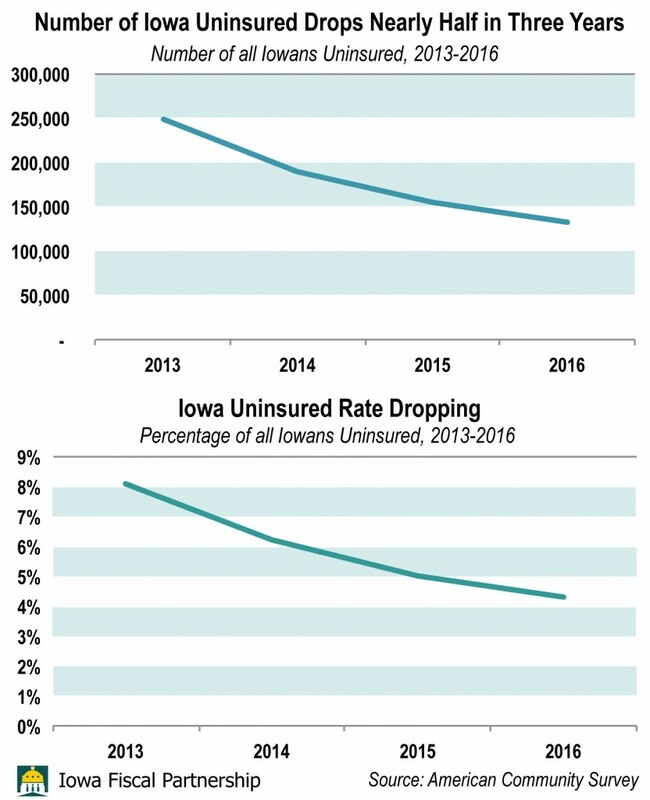 In Iowa alone, uninsurance dropped from over 8 percent to 5 percent in just two years. It is at best disingenuous for anyone to suggest otherwise, or to downplay the cut. Those who want to promote this legislation, for whatever reason, have to own the impact. If they’re afraid of the political disadvantage of admitting it, that’s another story. The stakes for some 200,000 Iowans are significant, jeopardizing recent health-care coverage gains and putting vulnerable Iowans at risk. An Iowa Fiscal Partnership report from Peter Fisher of the Iowa Policy Project sets the context for this week’s discussions in the Senate. A new report from the Center on Budget and Policy Priorities (see graph at right) shows how the Senate bill would drive up costs for the 31 states that — along with Washington, D.C. — expanded Medicaid under the ACA. For Iowa, the estimates are daunting: In 2021, Iowa would have $54 million more in costs, and in 2024, $395 million more — a 315 percent increase. That CBPP report is part of the exceptionally good information available even in the short time frame we have to understand what is emerging from the backrooms of Washington, out of public view. This is our business. We can demand to know the facts and we might just want to know them before the Senate votes — even if some in the Senate might be uncomfortable with that. 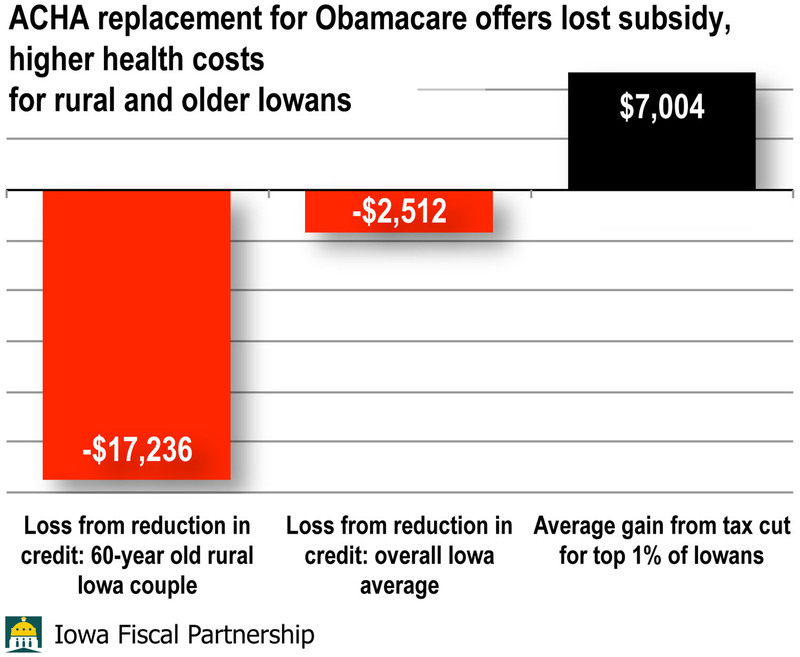 Replacing ACA will be costly to many Iowa families, particularly older and rural Iowans. Congressional Republicans have proposed replacing the Affordable Care Act, known as Obamacare, with the American Health Care Act, or AHCA. To understand why, suppose we follow the money — who loses, who gains? The much greater impact on rural Iowans is because the Republican plan gives everyone the same credit, whether they are in a high-cost or low-cost county. While the credit rises with age, the credits for older Iowans cover a far smaller share of their much higher insurance costs. Overall, the average Iowa family currently receiving subsidies for the purchase of insurance would see a $2,512 drop in the subsidy. But who are the winners? The Republican plan includes tax cuts primarily for the wealthiest Americans, as well as drug and insurance companies. The 400 highest-income taxpayers nationally would get annual tax cuts averaging about $7 million each. These taxpayers, whose annual incomes average more than $300 million, would receive tax cuts totaling about $2.8 billion a year. We now know how two of these cuts, amounting to $31 billion a year, would impact Iowans. The Affordable Care Act was financed in part by these two new taxes. One is the Net Investment Income Tax, the other the Additional Medicare Tax. Both fall primarily on the wealthiest. Repeal of these two ACA taxes would shower $116.7 million in tax cuts each year on just 1.9 percent of Iowa taxpayers. A full 92 percent of those tax cuts would go to the richest 1 percent of Iowa taxpayers — those making $444,000 a year or more, and with an average income of $1.17 million. Those taxpayers would receive on average $7,004 a year. “Follow the money” is good advice. But what you find when you get there is often not a pretty picture. Aviva Aron-Dine and Tara Straw. House Tax Credits Would Make Health Insurance Far Less Affordable in High-Cost States. Center on Budget and Policy Priorities, March 9, 2017.